Also serving communities of Green. There are 27 Assisted Living Facilities in the North Canton area, with 3 in North Canton and 24 nearby. To help you with your search, browse the 140 reviews below for assisted living facilities in North Canton. On average, consumers rate assisted living in North Canton 3.5 out of 5 stars. Better rated regions include Canton with an average rating of 4.2 out of 5 stars. Caring.com has helped thousands of families find high-quality senior care. To speak with one of our Family Advisors about assisted living options and costs in North Canton, call (855) 863-8283. Located in Stark County, less than 20 miles south of Akron, North Canton is a small rural city that serves as home to just under 18,000 Ohioans. Despite its small size, North Canton has a large senior community, with 21.5 percent of the population aged 65 and older. The city has three assisted living facilities, with 24 others in the surrounding areas of Canton, Barberton, and Wadsworth. As with the rest of the state of Ohio, North Canton assisted living facilities, also classified as residential care facilities, are regulated and licensed by the Ohio Department of Health. North Canton's climate is largely standard for the Midwest, with hot summers averaging 82 degrees Fahrenheit and cold winters averaging around 20 degrees Fahrenheit. Seniors sensitive to winter weather should be aware that snow levels are above the national average, coming in around 43 inches per year. Cost of living in North Canton is low. The city has a COL index of 88 out of a national average of 100 - a benefit for seniors on a budget. The tax situation for seniors is relatively advantageous in Ohio, North Canton included, with a marginal tax rate of only 2.97 percent and untaxed Social Security distributions. Public transportation in North Canton is provided by the Stark Area Regional Transit Authority, with numerous routes available throughout the greater metro area. SARTA is an approved Medicaid provider and offers free and discounted rides for eligible seniors. Crime is very low in North Canton, providing a safe place for seniors to call home. Versus a national average of 280.5 crimes per 100,000 residents, North Canton boasted a rate of only 93.4 in 2016.
facilities, including Aultman Medical Group North Canton Medical Center and Mercy Health Center of North Canton, in the event of medical emergencies or illness. Assisted Living costs in North Canton start around $0 per month on average, while the nationwide average cost of assisted living is $4,000 per month, according to the latest figures from Genworth’s Cost of Care Survey. It’s important to note that assisted living rates in North Canton and the surrounding suburbs can vary widely based on factors such as location, the level of care needed, apartment size and the types of amenities offered at each community. 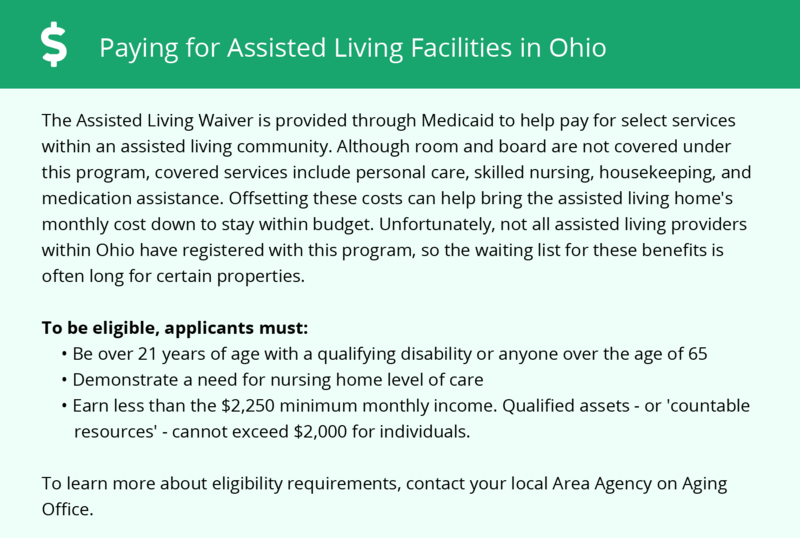 For seniors living in North Canton, financial assistance may be applicable through Ohio's Medicaid Waiver programs, including the assisted living waiver program. In addition, Stark County is among the 29 other counties participating in the MyCare Ohio program, a managed care program alternative for Medicaid recipients. 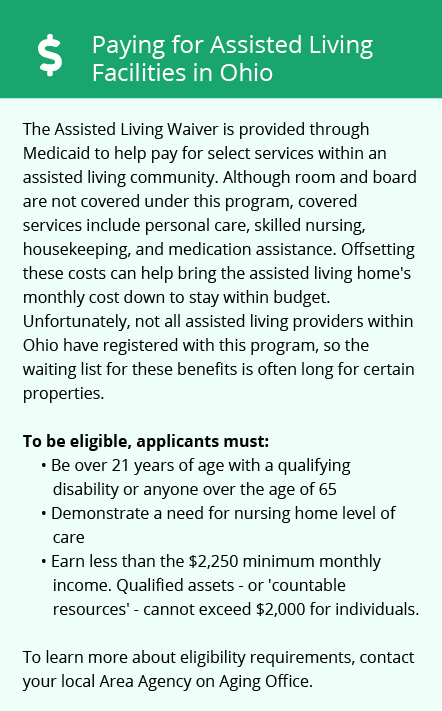 For those who do not have Medicaid, however, there are very few avenues available in North Canton. Seniors who meet state guidelines may be able to receive financial assistance through the Residential State Supplement (RSS) program. North Canton and the surrounding area are home to numerous government agencies and non-profit organizations offering help for seniors searching for or currently residing in an assisted living community. These organizations can also provide assistance in a number of other eldercare services such as geriatric care management, elder law advice, estate planning, finding home care and health and wellness programs. To see a list of free assisted living resources in North Canton, please visit our Assisted Living in Ohio page. North Canton-area assisted living communities must adhere to the comprehensive set of state laws and regulations that all assisted living communities in Ohio are required to follow. Visit our Assisted Living in Ohio page for more information about these laws.